Added calendar tables at the end of the manuscript begin with the year 1262, providing a terminus ante quem for the manuscript. Numerous marginal notations can be found throughout the manuscript, adding to or correcting the text. Produced for the use of a Dominican monastery, the Abbey Bible is one of the earliest and finest in a distinguished group of north Italian Bibles from the second half of the thirteenth and early fourteenth centuries. Most of these are associated with Bologna, one of the major centers for the production of Gothic illuminated Bibles. Its illumination is a superb example of the influence of the Byzantine style of the eastern Mediterranean that played a dominant role in Italian painting and manuscript illumination in the second half of the thirteenth century. The illumination and marginal vignettes of the Abbey Bible are remarkable for their liveliness and delicacy. Sensitively depicted facial expressions, rare among Bibles of this era, and dynamic compositions, reveal the artist to be a skilled storyteller. While filled with amusing figures and spirited pen flourishes, the Bible was nevertheless intended for serious use and study. The text contains many edits, corrections, and amendments, suggesting a university origin for the manuscript. The book appears to be made for a Dominican monastery and devout Dominicans and Franciscans appear prominently in its imagery. Warner, George. Descriptive Catalogue of Illuminated Manuscripts in the Library of C. W. Dyson Perrins. 2 vols. (Oxford: Oxford University Press, 1920), vol. 1, pp. 138-145, no. 51; vol. 2, unpaginated, pls. 53-55.
d'Ancona, Paolo. La Miniature Italienne du Xe au XVIe (Paris and Brussels: Librairie Nationale d'Art et d'Histoire, 1925), p. 18n2. Toesca, Pietro. Storia dell'Arte Italiana. Vol. 2, Il medioevo. 2 vols. (Turin: Unione Tipografico-Editrice Torinese, 1927), vol. 2, p. 1134n14. Castelfranco, Giorgio. "Contributi alla storia della miniatura bolognese del '200," Bologna, rivista mensile del Comune 7 (July 1935), pp. 12, 14-15, fig. 5. Maggs Bros., London. Manuscripts, Rare Books, Oriental Miniatures. Autumn 1960, pp. 16, 84-85, lot 78, ill.
International Confederation of Art Dealers. Third International Art Treasures Exhibition, exh. cat. (London: Victoria and Albert Museum, 1962), p. 79, no. 650, pl. 327. Daneu Lattanzi, Angela. "Ancora sulla scuola miniaturistica dell'Italia meridionale Sveva: Suo contributo allo sviluppo della miniatura bolognese," La Bibliofilia 66 (1964), p. 150. Orlandi, Stefano. "I libri corali di S. Maria Novella con miniature dei secoli XIII e XIV," Memorie domenicane 82 (1965), pp. 195-96. Rotili, Mario. La Miniatura Gotica in Italia (Naples: Libreria Scientifica Editrice, 1968), p. 54. Alexander, Jonathan J. G., and Albinia C. de la Mare. The Italian Manuscripts in the Library of Major J.R. Abbey (London: Faber and Faber, 1969), pp. 12-19, no. J.A. 7345, pls. A, 6b, 7-8, entry by Jonathan J. G. Alexander. Fallani, Giovanni. "Ricerca sui protagonisti della miniatura dugentesca: Oderisi da Gubbio e Franco Bolognese." Studi danteschi 48 (1971), p. 139. Lemarié, Joseph. "L'iconographie de Saint Chromace d'Aquilée." Aquileia nostra, 45-46 (1974-1975), cols. 683-84. Eleen, Luba. "Acts Illustration in Italy and Byzantium." Dumbarton Oaks Papers 31 (1977), pp. 262-64, appendix, figs. 39, 50. Euw, Anton von, and Joachim M. Plotzek. Die Handschriften der Sammlung Ludwig. 4 vols. (Cologne: Schnütgen-Museum, 1979-1985), vol. 1 (1979), p. 106. Passalacqua, Roberta. I codici liturgici miniati dugenteschi nell'Archivio Capitolare del Duomo di Arezzo (Florence: Giunta regionale toscana & La Nuova Italia Editrice, 1980), p. 72, fig. 59. Conti, Alessandro. La miniatura bolognese: scuole e botteghe, 1270-1340 (Bologna: Edizioni ALFA, 1981), p. 23n17. Ciardi Duprè dal Poggetto, Maria Grazia. "La miniatura nei libri francescani." Francesco d'Assisi, Documenti e Archivi, Codici e Biblioteche, Miniature (Milan: Electa, 1982), p. 325. Gousset, Marie-Thérèse. "Un témoignage inédit de l'enluminure bolonaise du XIIIe siècle," Revue de l'Art 57 (1982), p. 55n7, 10. Eleen, Luba. The Illustration of the Pauline Epistles in French and English Bibles of the Twelfth and Thirteenth Centuries (Oxford: Clarendon Press, 1982), pp. 29, 32n187, 33n190-191, 34, 35n198, 77, 91, 94, 99-100, 109, pls. 195, 224. Avril, François, and Marie-Thérèse Gousset. Manuscrits Enluminés d'Origine Italienne. Vol. 2, XIIIe siècle (Paris: Bibliothèque nationale, 1984), pp. 77n7, 78n8-9, 86.
de Hamel, Christopher. A History of Illuminated Manuscripts (Oxford: Phaidon, 1986), p. 117, pl. 114. Corrie, Rebecca W. "The Conradin Bible, Ms. 152, The Walters Art Gallery: Manuscript Illumination in a Thirteenth-Century Italian Atelier." Ph.D. diss. (Harvard University, 1986), pp. 82, 164, 167, 170-72, 181, 198, 200, 225, 230, 281, 521-23, 531, 535. Sotheby's, London. Catalogue of The Celebrated Library of the late Major J.R. Abbey. June, 19, 1989, pp. 31-45, lot 3013, ill., back cover ill.
Norris, Michael Byron. 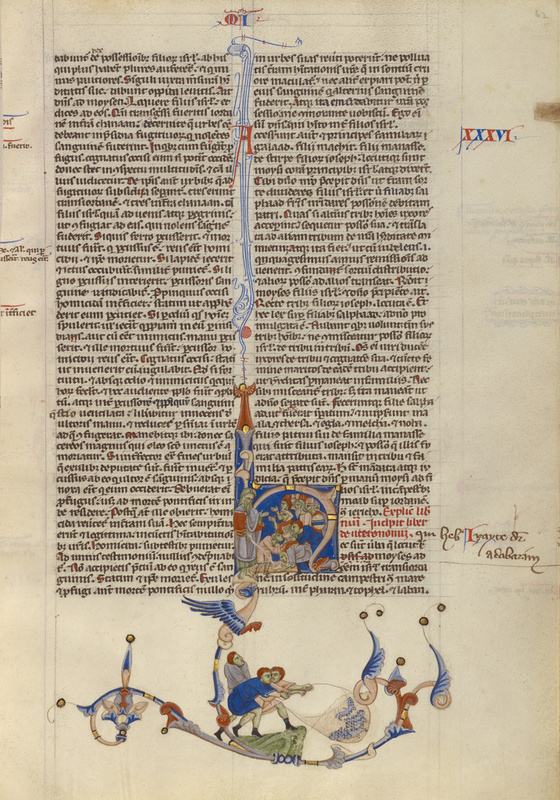 "Early Gothic Illuminated Bibles at Bologna: the `prima maniera' Phase, 1250-1274." Ph.D. diss. (University of California, Santa Barbara, 1993), pp. 7, 251, 263, 275, 286-92, 503-504, 685-700, 899-900, 905, figs. 59, 60, 65, 66, 68, 127. Valagussa, Giovanni, "Il Miniatore di Lanfranco de Pancis: un nuovo personaggio nella storia della miniatura duecentesca." Arte Cristiana 81, no. 758 (September-October 1993), pp. 323-25. Benati, Daniele, ed. "Prima di Giotto." Il Trecento riminese: Maestri e botteghe tra Romagna e Marche (Milan: Electa, 1995), pp. 74-75, figs. 46-47, entry by Giovanni Valagussa. Lollini, Fabrizio, "Tre schede per l'arte in Romagna tra XIII e XIV secolo." Romagna arte e storia 16, no. 47 (May-August 1996), p. 87n2. Dauner, Gudrun. Neri da Rimini und die Rimineser Miniaturmalerei des frühen Trecento (Munich: scaneg, 1998), pp. 41-42, no. 25, 26, ill.
Medica, Massimo, and Stefano Tumidei, eds. Duecento: forme e colori del Medioevo a Bologna, exh. cat. (Bologna: Miseo Civico Archeologico, 2000), p. 123. Medica, Massimo, ed. Duecento. Forme e colori del Medioevo a Bologna, exh. cat. (Venice: Marsilio, 2000), pp. 122-23; 244 under no. 68, entry by Marie-Thérèse Gousset. Lollini, Fabrizio. "Maestro di Imola." In Dizionario biografico dei miniatori Italiani. Secoli IX XVI. Milvia Bollati, ed. (Milan: Sylvestre Bonnard, 2004), p. 685. Lollini, Fabrizio. "Maestro di Bagnacavallo." In Dizionario biografico dei miniatori Italiani. Secoli IX XVI. Milvia Bollati, ed. (Milan: Sylvestre Bonnard, 2004), p. 678. Valagussa, Giovanni. "Miniatore di Lanfranco de Pancis." In Dizionario biografico dei miniatori Italiani. Secoli IX XVI. Milvia Bollati, ed. (Milan: Sylvestre Bonnard, 2004), p. 779. Christie's, London. The Arcana Collection: Exceptional Illuminated Manuscripts and Incunabula, Part I. July 7, 2010, pp. 64-71, lot 28, ill., frontispiece ill.
Waldmann, Klaus. "Splendore Miniato: La Miniatura Gotica al Getty." Alumina Pagine Miniate 10, no. 36 (January-March 2012), p. 47, ill.
Sciacca, Christine, ed. Florence at the Dawn of the Renaissance: Painting and Illumination, 1300-1350, exh. cat. (Los Angeles: J. Paul Getty Museum, 2012), pp. 133, under no. 30; 267, under no. 45.16, entries by Christine Sciacca. Keene, Bryan C. "Preparing the Soul for Heaven through Text and Song: Liturgical Manuscripts." In Florence at the Dawn of the Renaissance: Painting and Illumination, 1300-1350, exh. cat. Christine Sciacca, ed. (Los Angeles: J. Paul Getty Museum, 2012), p. 95, ill.
Loewen, Peter V. Music in Early Franciscan Thought (Leiden: Brill, 2013), cover ill.
Lollini, Fabrizio, "Due torri una fede. Una Bibbia domenicana bolognese." Alumina Pagine Miniate 11, no. 43 (October-December 2013), pp. 6-13, ill.
Freuler, Gaudenz. Italian Miniatures from the Twelfth to the Sixteenth Centuries. 2 vols. (Milan: Silvana Editoriale Spa, 2013), vol. 1, p. 11, ill.
Kennedy, Trinita, ed. Sanctity Pictured: The Art of the Dominican and Franciscan Orders in Renaissance Italy, exh. cat. (Nashville: Frist Center for the Visual Arts with Philip Wilson Publishers, 2014), pp. 96-97, ill., cover ill., entry by Christine Sciacca. Morrison, Elizabeth, Mary Louise Hart, and Justine Andrews. "Splendori dal Bosforo: Arte bizantina a Los Angeles." Alumina: Pagine miniate 12, no. 45, Lucia Mariani, trans. (April-June 2014), p. 51, ill.
Kennedy, Trinita. "Sanctity pictured: the art of the Dominican and Franciscan orders in Renaissance Italy." In Sanctity Pictured: The Art of the Dominican and Franciscan Orders in Renaissance Italy, exh. cat. Kennedy, Trinita, ed. (Nashville: Frist Center for the Visual Arts with Philip Wilson Publishers, 2014), pp. 1, 8, 16, figs. 1, 10. Kren, Thomas, and Kurt Barstow. 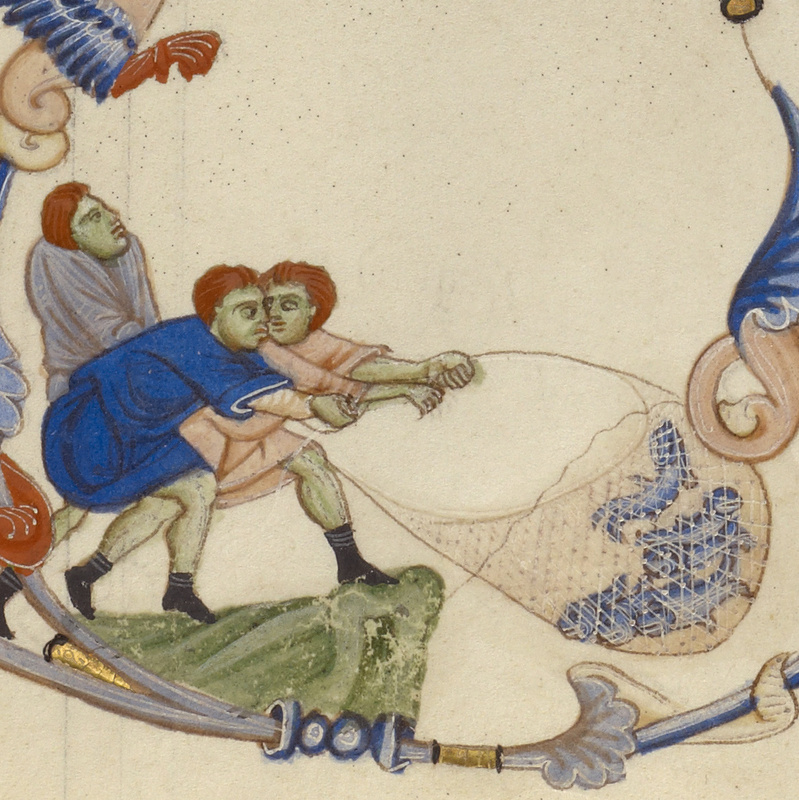 Italian Illuminated Manuscripts in the J. Paul Getty Museum. 2nd ed. (Los Angeles: The J. Paul Getty Museum, 2015), pp. vii, xiii, 8-11, ill.
Kempf, Damien, and Maria L. Gilbert. Medieval Monsters (London: British Library, 2015), p. 36b, ill.